From server management to protocol analysis to insights into systems, networking and traffic flows, these free, open-source monitoring tools have you covered. If your "right job" involves wrangling computer networks and figuring out how to do digital things effectively and efficiently or diagnosing why digital things aren't working as they're supposed to, you've got your hands full. Not only does your job evolve incredibly quickly becoming evermore complex, but whatever tools you use need frequent updating and/or replacing to keep pace, and that's what we're here for; to help in your quest for the right tools. We've done several roundups of free network tools in the past, and since the last one, technology has, if anything, sped up even more. To help you keep up, we've compiled a new shortlist of seven of the most useful tools that you should add to your toolbox. We've got an excellent tool for tracking and managing your IP address space, an amazing tool for ad hoc programming by wiring modules of code together, a powerful workflow platform, the broadest security penetration-testing platform we know of, a slick Web-based server management system and arguably the best and most capable network packet capture and analysis application available. So, you've got the right job and now, you've got the right tools. Martha would be proud of you. As networks grow bigger, they become increasingly complex. Keeping a handle on your network will eventually become impossible without tools to help you plan and track what you've got, where it is and how it's configured. Far too many organizations start off using Excel spreadsheets for this kind of task, but as their networks scale there always comes a point when they wind up with a bunch of Frankensheets that become so unwieldy as to be useless. We have a better way. TeemIP from Combodo is a better strategy for three important reasons; it scales, it provides consistent and comprehensive documentation of your network IP resources and it's free. TeemIP is a Change Management Database system that combines IP address management with a trouble-ticketing system so that IP addresses and network devices can be managed in the context of locations, organizations, users and roles, and user trouble and change requests can be tracked. 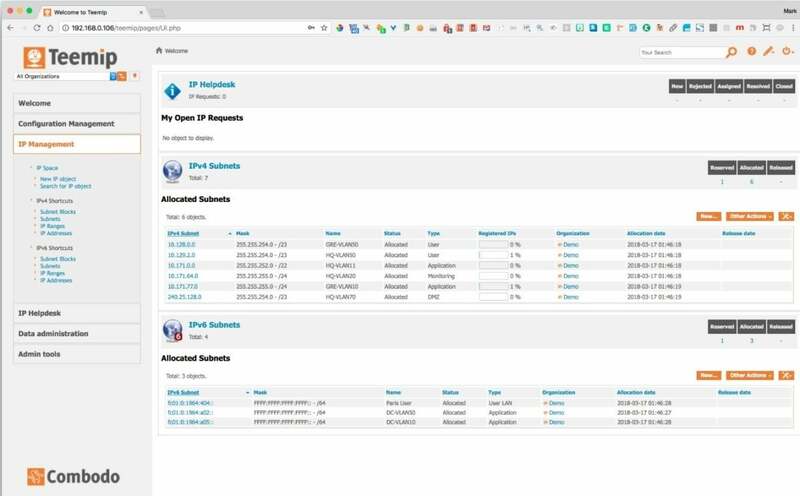 You can allocate IP addresses and define reserved ranges for devices such as printers and DHCP service as well as split, shrink and expand subnets and subnet blocks, and generate reports and run audits. There's also the ability to integrate external data sources, such as device discovery, and import a huge range of data from CSV files, which, if you've been relying on spreadsheets, gives you the invaluable ability to repurpose existing data. You can also export to CSV, HTML and XML formats using Object Query Language. TeemIP, which is free and open source, comes in two versions: standalone or as an extension to Combodo's ITop, an IT Services Management solution which, in turn, has a FOSS community edition as well as three premium editions with additional features. 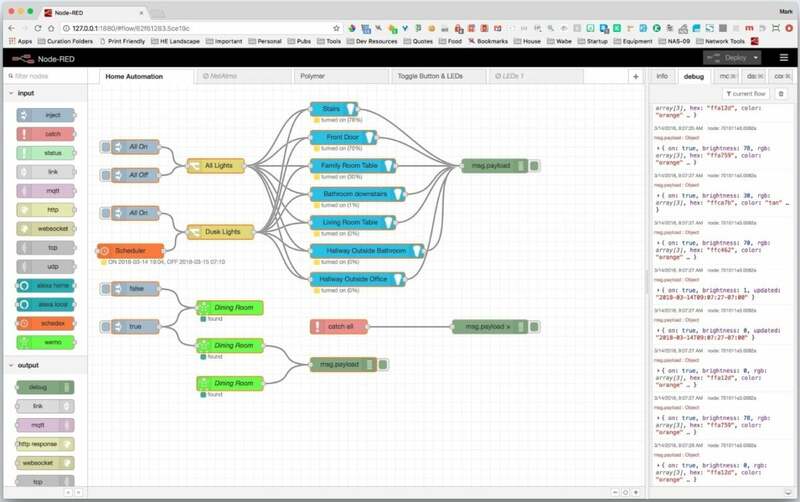 While much has been written about Node-RED's role in IoT solutions, it's also an incredibly useful general-purpose application platform particularly for quick, ad-hoc solutions that makes it an invaluable addition to your digital toolkit. The first node fields HTTP requests on the end point /lights under the Node-RED server's base URL then the second node, triggered by a message from the first node, makes an HTTP request to the Philips Hue bridge on my network. The response is a JSON structure that reports the status of the Hue bulbs in my house. This response is then sent to the third node and used as the response to the original request with the Content-Type header set to application/json. I'm using the Chrome JSON Viewer.